Do you need an exhaust solution to eliminate lint-laden air from a central laundry facility? Or for the bathrooms, kitchens or clothes dryer in a multi-story apartment building? These applications need a reliable source of combustion air/make-up air. Especially if there are multiple appliances on multiple floors, duct design issues (elbows, long runs, etc. ), or possible code violations. Simplify these challenges with the ENERVEX BEF Box Fan. 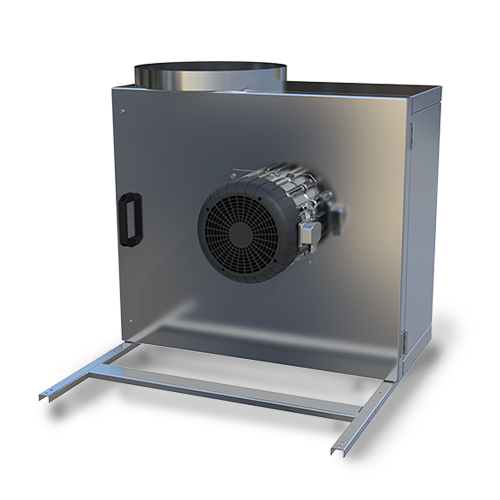 This high-efficiency ventilator has a backward curved centrifugal impeller and complete insulation, designed to reduce noise and condensation in both intake and exhaust appliances. Simply install the BEF Box Fan at the exhaust duct termination point to ensure a negative pressure in the entire duct system – or inline. Listings UL 705 Standard for Power Ventilators with special consideration for venting lint-laden air from single or multiple dryers.